Everyone stares at them, everyone blames. They lay awake for those who will burn. As promised, here I am with some impressions on the second book of The Luxe series. In the first one, The Luxe, we entered the fascinating Manhattan of the 19th century, met the main characters and learned about their goals and aspirations (read about it here). 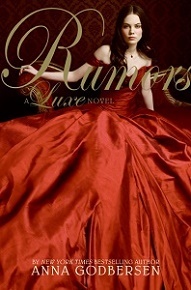 Anna Godbersen continues her story with Rumors, the second book. 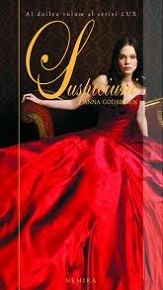 Again, I loved the book cover. Yes, I know, the cover is not that important, but some covers are so beautiful that you just need to take the books home, to read them and place them on that special bookshelf of your bookcase. In this volume, we enter the story with the cover in mind – that red dress of Diana and her angelic face framed by her pretty dark hair. Well, this is not the image that I discovered in the book, but I found it very suitable not only for the character Diana, but for Diana as a symbol of that century. That was the way love was, she guessed-it left you always unsteady on your feet. The story goes on with the tragedy of Holland’s family. The unexpected death of Elizabeth – Manhattan’s high society favorite and spoiled figure – disrupts everyone’s peace. Great plans turn into smoke, new intrigues appear, and friendships are broken. But as life goes on, new alliances form unexpectedly. This is Diana’s moment, to live her sisters’ life. But she will soon realize that it’s not that simple to be on everyone’s radar, to be the subject of gossip and the only one who can save her family from ruin. She will have to sacrifice her love for her family, a sacrifice that her sister couldn’t make and led to her sudden disappearance. So this was betrayal. It was like being left alone in the desert at dusk without water or warmth. It left your mouth dry and will broken. It sapped your tears and made you hollow. Rumors is the book of empty illusions. Each character seems to have their own tragedy. They lose their fortune, love, hopes and, at the end, they seem to get exactly the opposite of what they wanted. In fact, it’s just like life itself. Don’t we all have our moments of total disappointment? This book is a little life lesson drawn in silky colors and placed into grand ballroom halls. The end of the book makes you feel helpless against the cruel destiny. But then you realize that there is another book in the series and you regain hope. What’s next for the Holland sisters? Would that beautiful feeling called love, a feeling that they both embraced, overcome difficulties? I recommend you to read this series! It is a kind of Gossip Girl of the 19th century. It’s a journey in a fabulous world that any Diva would love to know, at least from a certain distance.